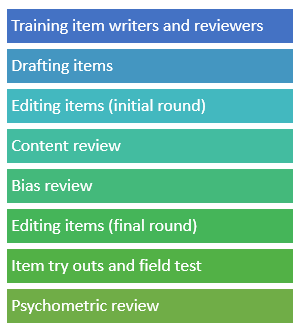 Item Analysis is probably the most important tool for increasing test effectiveness. In order to write items that accurately and reliably measure what they’re intended to, you need to examine participant responses to each item. You can use this information to improve test items and identify unfair or biased items. So what’s the process for conducting an item analysis? What should you be looking for? How do you determine if a question is “good enough”? 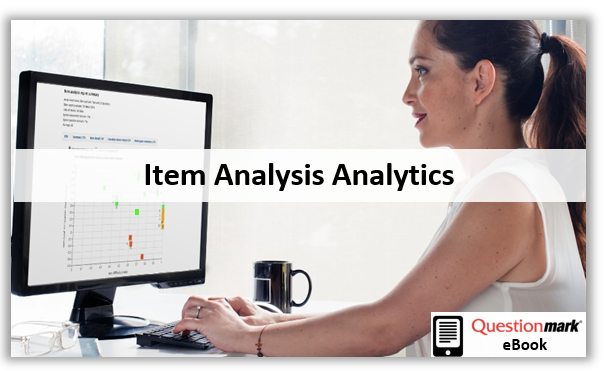 Questionmark has just published a new eBook “Item Analysis Analytics,” which answers these questions. The eBook shares many examples of varying statistics that you may come across in your own analyses. This eBook is available as a PDF and ePUB suitable for viewing on a variety of mobile devices and eReaders. Examples of satisficing behavior are skipping questions or picking the first answer that makes some kind of sense. Satisficing is very common. As explained in the previous blog, some reasons for it are participants not being motivated to answer well, not having the ability to answer well, them finding the survey too hard or them simply becoming fatigued at too long a survey. 1. Keep surveys short. Even the keenest survey respondent will get tired in a long survey and most of your respondents will probably not be keen. To get better results, make the survey as short as you possibly can. 2. Keep questions short and simple. A long and complex question is much more likely to get a poor quality answer. You should deconstruct complex questions into shorter ones. Also don’t ask about events that are difficult to remember. People’s memory of the past and of the time things happened is surprisingly fragile, and if you ask someone about events weeks or months ago, many will not recall well. 3. Avoid agree/disagree questions. Satisficing participants will most likely just agree with whatever statement you present. For more on the weaknesses of these kind of questions, see my blog on the SAP community network: Strongly Disagree? Should you use Agree/Disagree in survey questions? 4. Similarly remove don’t know options. If someone is trying to answer as quickly as possible, answering that they don’t know is easy for them to do, and avoids thinking about the questions. 5. Communicate the benefit of the survey to make participants want to answer well. You are doing the survey for a good reason. Make participants believe the survey will have positive benefits for them or their organization. Also make sure each question’s results are actionable. If the participant doesn’t feel that spending the time to give you a good answer is going to help you take some useful action, why should they bother? 6. Find ways to encourage participants to think as they answer. For example, include a request to ask participants to carefully deliberate – it could remind them to pay attention. It can also be helpful to occasionally ask participants to justify their answers – perhaps adding a text comment box after the question explaining why they answered that way. Adding comment boxes is very easy to do in Questionmark software. 7. Put the most important questions early on. Some people will satisfice and they are more likely to do it later on in the survey. If you put the questions that matter most early on, you are more likely to get good results from them. There is a lot you can do to reduce satisficing and encourage people to give their best answers. 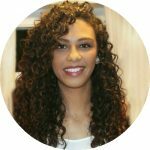 I hope these strategies help you shrink the amount of satisficing your survey participants do, and in turn give you more accurate results. Online proctoring was a hot-button topic at Questionmark’s annual Users Conference. And though we’ve discussed the pros and cons in this blog and even offered an infographic highlighting online versus test-center proctoring, many interesting questions arose during the Ensuring Exam Integrity with Online Proctoring session I presented with Steve Lay at Questionmark Conference 2016. I’ve compiled a few of those questions and offered answers to them. For context and additional information, make sure to check out a shortened version of our presentation. If you have any questions you’d like to add to the list, comment below! 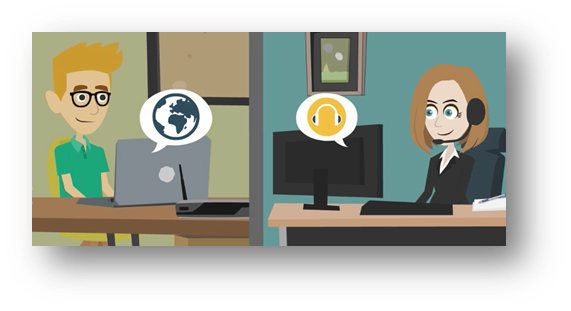 What control does the online proctor have on the exam? What does an online proctor do if he/she suspects cheating? Usually the proctor will terminate the exam and file a report to the exam sponsor. What happens if the exam is interrupted, e.g. by someone coming in to the room? This depends on your security protocols. Some organizations may decide to terminate the exam and require another attempt. In some cases, if it seems an honest mistake, the organization may decide that the proctor can use discretion to permit the exam to continue. Which is more secure, online or face-to-face proctoring? On balance, they are about equally secure. Unfortunately there has been a lot of corruption with face-to-face proctoring, and online proctoring makes it much harder for participant and proctor to collude as there is no direct contact, and all communication can be logged. But if the proctors are honest, it is easier to detect cheating aids in a face-to-face environment than via a video link. What kind of exams is online proctoring good for? If your technology or subject area changes frequently, then online proctoring is particularly good because you can easily give more frequent exams, without requiring candidates to travel. What kind of exams is online proctoring less good for? How do you prepare for online proctoring? I hope these Q&A and the linked presentation are interesting. You can find out more about Questionmark’s online proctoring solution here. Have you ever answered a survey without thinking too hard about it, just filling in questions in ways that seem half sensible? This behavior is called satisficing – when you give responses which are adequate but not optimal. Satisficing is a big cause of error in surveys and this post explains what it is and why it happens. Very few of us satisfice when taking a test. We usually try hard to give the best answers we can. But unfortunately for survey authors, it’s very common in surveys to answer half-heartedly, and satisficing is one of the common causes of survey errors. Eighty-one percent of participants satisficed at least in part. Thirty-six percent rushed through parts of the survey too fast to be giving optimal answers. The amount of satisficing increased later in the survey. Satisficing impacted the validity and reliability of the survey and of any correlations made. It is likely that for many surveys, satisficing plays an important part in the quality of the data. There are a few tricks to help identify satisficing behavior, but the first thing to look for when examining the data is straight-lining on grid questions. According to How to Spot a Fake, an article based on the Practices that minimize online panelist satisficing behavior by Shawna Fisher, “an instance or two may be valid, but often, straight-lining is a red flag that indicates a respondent is satisficing.” See the illustration for a visual. 1. Participant motivation. Survey participants are often asked to spend time and effort on a survey without much apparent reward or benefit. One of the biggest contributors to satisficing is lack of motivation to answer well. 2. Survey difficulty. The harder a survey is to answer and the more mental energy that needs to go into thinking about the best answers, the more likely participants are to give up and choose an easy way through. 3. Participant ability. Those who find the questions difficult, either because they are less able, or because they have not had a chance to consider the issues being asked in other contexts are more likely to satisfice. 4. Participant fatigue. The longer a survey is, the more likely the participant is to give up and start satisficing. So how can we reduce satisficing? The answer is to address these reasons in our survey design. I’ll suggest some ways of doing this in a follow-up post. 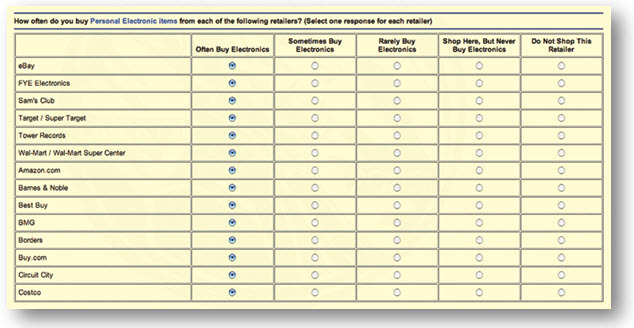 I hope thinking about satisficing might give you better survey results with your Questionmark surveys! Creating fair, valid and reliable tests requires starting off right: with careful planning. Starting with that foundation, you will save time and effort while producing tests that yield trustworthy results. 1. Plan: What elements must you consider before crafting the first question? How do you identify key content areas? 2. Create: How do you write items that increase the cognitive load, avoid bias and stereotyping? 3. Build: How should you build the test form and set accurate pass/ fail scores? 4. 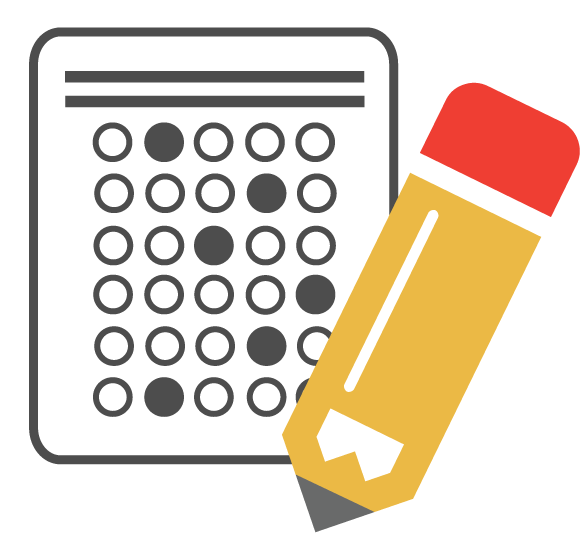 Deliver: What methods can be implemented to protect test content and discourage cheating? 5. Evaluate: How do you use item-, topic-, and test-level data to assess reliability and improve quality? Download this complimentary white paper full of best practices for test design, delivery and evaluation.